Thanks!!!!!!!!!!!! for calling me DIDI,1st time koi sharif banda nazar aya hai board par. A man is soft when he's hard and hard when he's soft. winning is my birthright !! Abey kankhajure, chaparkanati, madhumakhhi ke chatte me haath dalega to kya milega, mathura ka peda. Gandi baat hi kariyo hamesha, tujhe to Ganga se bhi nahlao na tub bhi bhagega Dalito ke mohalle ki taraf. tu Gay tha, gay he aur gay rahega. Indian government has long foregone the time for formulating a workable language policy. It was possible only around initial days of independence. Current policies will ensure that Indian languages would be killed year after year and major ones will keep getting useless. In present day India, only English can lead you to a better life. Hindi and other regional languages are good for streets, home, mass entertainment and occasional political posturing. But they are not suitable for any serious work. There has been many more grand ceremonies and committes like the ones you mentioned in past. And there would be many more until, as mm suggested in a previous post that English would be written on that map in next century. Like I said, we lost the battle long time ago. Now there would be high costs which I don't think people can pay. Anyway, market forces will kill all useless languages. 2 centuries ago, Indians kings and people were fighting among themselves and English people took over and enslaved everyone. Now, Indian languages fight among themselves and English have effectively made those languages useless. 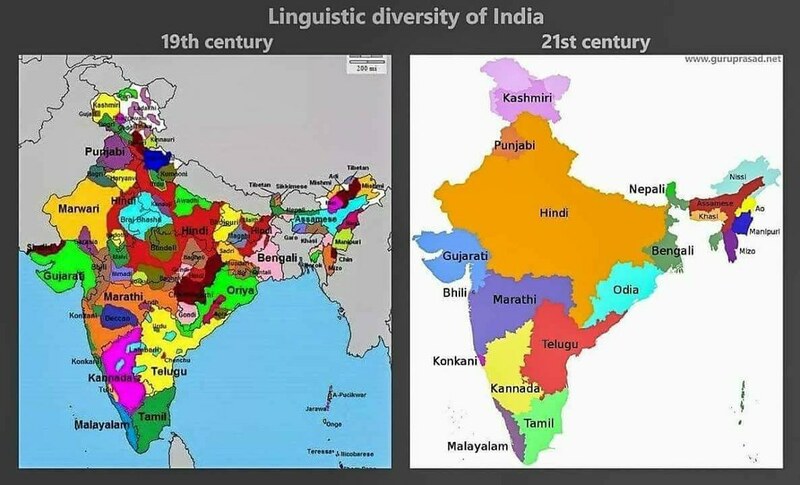 Now it would be interesting to see if Indian languages, like Indians in history could kick out the English and improve themselves. Union Govts last 70 years have done enough harm to the diversity of India. India has woken up from slumber to protect its mother tongues. Get out of the mindset to impose your language , we do not need a lingua franca at all, we can enrich our own 22/38 languages and make sure our higher education has it. Let BIMARU do the same we do not impose ours on them. MAJORITARIANISM is the biggest problem in India. Unity in Diversity, we said when we joined Indian Union, now that you have numbers you want to kill ours and promote yours , oh please be "Roman in Rome" we will learn Hindi incase all of UP has mandated Kannada. Lets give the Rajasthanis,Marwadis , Chattisgharis Bhojpuris , Tuluva & Kodava their rights. Lets make all languages official in Indian Union.